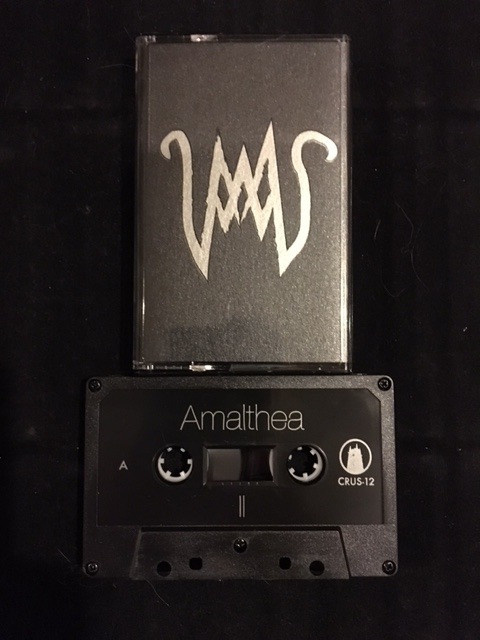 This 2016 cassette is the second release (check out the first here) from Gothenburg, Sweden duo Amalthea (Jonas Lindgren of Aether and Michael Idehall). Cloister Recordings describes this tape as a mix of “minimalistic industrial” and “noise pop,” which seems like an impossible combination until you dive into these four hypnotic tracks. On the one hand, there are the sounds of pure dread: in T1, a leaden thud falls on each beat, making the seconds drag by achingly; T2 is a long, lingering drone; T4 heaves with agonized wailing and dissonant, distorted tones. But on the other hand, there’s flashes of beauty that keep the whole thing from being a total downer (no offense, you know I get down with a total downer now and then) – take T1’s repeating melodic bass line, the dappled tones in T2, the brilliant stabs and rhythms of T3, the rich, strange harmonies that murmur through T4. The contrasts come together to create an experience of gorgeous, satisfying pain.